2004-03-08 First worldwide family litigation filed litigation Critical https://patents.darts-ip.com/?family=26714663&utm_source=google_patent&utm_medium=platform_link&utm_campaign=public_patent_search&patent=EP0860980(A2) "Global patent litigation dataset” by Darts-ip is licensed under a Creative Commons Attribution 4.0 International License. A digital camera includes a liquid crystal display (LCD) for viewing images captured from an image sensor and stored on a removable memory card. The LCD also presents a user interface (UI) that allows the user to create a print order "utilization file". As individual images are viewed, the user can decide how many (if any) prints to make of the image, the print size, and the print quality (low cost ink jet versus high quality thermal prints, for example). The memory card can then be inserted in a home printer, walk-up kiosk, or dropped off/mailed to a photofinisher, or the camera itself can be connected to the printer or kiosk via a wired or wireless (e.g., IrDA) link. The print order can then be automatically produced without any additional user intervention. Reference is made to commonly assigned copending applications Serial No. 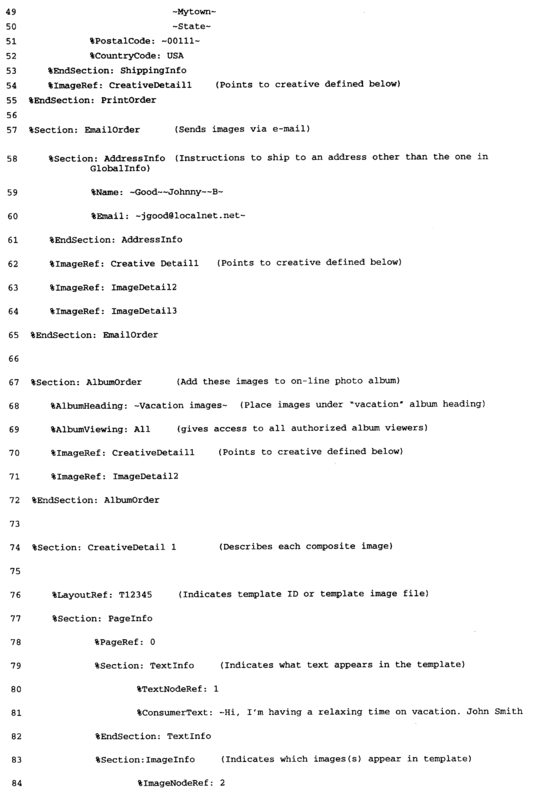 60/037,962, entitled "Network Configuration File for Automatically Transmitting Images from an Electronic Still Camera" and filed on the same date herewith in the names of Joseph Ward, Kenneth A. Parulski, and James D. Allen, and which is assigned to the assignee of this application. The invention relates generally to the field of photography, and in particular to electronic photography. More specifically, the invention relates to a digital camera that can be interfaced with a host computer. Digital cameras, such as the Kodak Digital Science DC25™ camera, allow images to be utilized on a home computer (PC) and to be incorporated into e-mail documents and personal home pages on the World Wide Web. Presently, if a print is desired, each image must first be copied to the PC and then individually printed. The user is required to manually select each image to be printed, and manually decide how big each print should be and how many prints to make of each image. In addition, it is possible for users to electronically send images to others using software, such as the Kodak Digital Science Picture Postcard Software™. However, this again requires the user to manually download each image to the host computer, select each image to be transmitted, and create a new "Postcard" for each image to be sent. Users can also create "albums" of photos on their computers using software such as the Family Album Creator™ by Creative Wonders, Inc. Again, however, this is a manual process that requires each image to be downloaded to the computer, individually selected, and added to the album. In U.S. Patent 5,241,659, reprint information can be generated at the time a PhotoCD disc is played back. This patent describes an EEPROM card that can be inserted into a PhotoCD player. As shown in Figs. 3, 5, and 6 of this patent, the EEPROM card can contain reprint order information and "album disc" information input by the player operator. However, this information is not generated at the time of picture taking, and is not stored on the same media as the images. Moreover, the reprint information does not include information useful to the service provider, such as user account, charge card, mailing address, etc. What is needed is a way for camera users to quickly and easily compose "print orders" and "transmission orders" and/or "electronic albuming" orders, at the time they capture their images. The present invention is directed to overcoming one or more of the problems set forth above. Briefly summarized, according to one aspect of the present invention, the camera and system of our invention meets this need by allowing the user to select "downstream" services at the time of capture, using the camera's LCD screen and user interface. The digital camera includes a liquid crystal display (LCD) for viewing images captured from a CCD sensor and stored on a removable memory card. The LCD also presents a user interface (UI) that allows the user to create a print order "utilization file". As individual images are viewed, the user can decide how many (if any) prints to make of the image, the print size, and the print quality (low cost ink jet versus high quality thermal prints, for example). The memory card can then be inserted in a home printer, walk-up kiosk, or dropped off/mailed to a photofinisher, or the camera itself can be connected to the printer or kiosk via a wired or wireless (e.g., IrDA) link. The print order can then be automatically produced without any additional user intervention. Alternately, a modem in the camera or card reader can transmit the utilization file and the image data to a print service provider, which can produce the prints and return them via mail to the user, or to a party designated by the user. The utilization file can alternately include e-mail addresses to allow images to be automatically sent to others, postal address information for sending print images, or albuming information to allow images to be placed in an on-line image database. FIG. 1 is a block diagram of the system according to the invention. FIG. 2 is a diagram of downstream services available in the system shown in Figure 1. FIG. 3 is an illustration of one example of a creative background added to an image. FIG. 4 is a diagram of the organization of a utilization file. FIG. 5 is a diagram of another organization of a utilization file together with each image file. Because imaging systems and devices are well known, the present description will be directed in particular to elements forming part of, or cooperating more directly with, apparatus in accordance with the present invention. Elements not specifically shown or described herein may be selected from those known in the art. Some aspects of the present description may be implemented in software. Unless otherwise specified, all software implementation is conventional and within the ordinary skill in the programming arts. 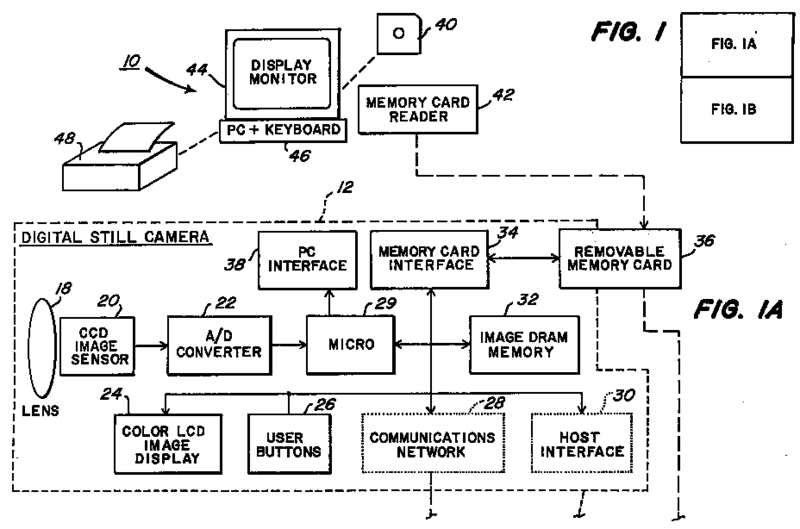 A system block diagram of the invention is shown in Figure 1, and includes a user's host computer(PC) 10, a digital camera 12, equipment located at a "downstream" service provider 14, and equipment at a walk-up kiosk 16. The camera 12 includes an optical section 18 for imaging a scene upon an image sensor 20 and generating an image signal, an A/D converter 22 for digitizing the image signal, a liquid crystal display (LCD screen) 24 for displaying images and other information, a number of user input buttons 26, and both internal memory 32 and a removable memory card 36 for storing captured images. The camera may optionally include an internal communications interface 28 (e.g. modem). A microprocessor 29 generally controls the operation of the camera 12, and interchanges data through a memory card interface 34 with the memory card 36, through a PC interface 38 with the host computer 10, through a host interface 30 directly with the kiosk 16, and through the communications interface 28 and a communications network 31 with the service provider 14. When the camera is purchased, it is provided with a software application (located on a disc 40) for running on the user's host PC 10 that enables the user to specify the name(s) of downstream service providers, network addresses (friends, family or business associates) and related account information such as billing information (charge card number, mailing addresses, etc.). The user can also select, through the software application, one or more "creative backgrounds" offered by the service provider (such as a postcard border) and enter one or more text messages, (such as "Hi, I'm having a relaxing vacation, John Smith"), as will be described in connection with Figure 3. All of this information can then be downloaded, via a memory card reader 42 on the host PC 10, to the removable memory card 36, which can be subsequently inserted into the camera. Alternatively, the information can be downloaded to the camera 12 via the host PC interface 38 and written to the camera's internal memory 32 or the removable memory card 36 in the camera. Typically, keyword descriptors accompany the information to enable easy access by the camera user. After placing the memory card 36 in the camera (or disconnecting the camera from the host PC 10), the user can operate the camera 12 to take numerous pictures, which are stored either in the internal memory 32 or in the memory card 36 (or in both). After taking pictures, the user reviews the images on the LCD screen 24, using the buttons 26 to scroll through the images. The user can then select the desired "downstream services" (printing, e-mailing, and/or albuming) and compose the order using the options listed in Figure 2. These services and options are accessed from the memory card 36 and, for example, the keyword descriptors are assembled in a menu and displayed on the LCD screen 24. Selections among these services and options are made, for example, by reference to the keyword descriptors and actuation of the user buttons 26. 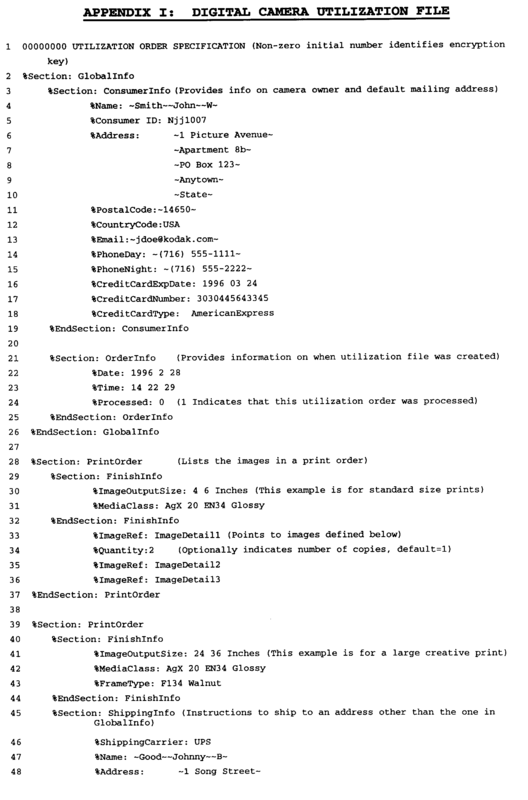 The details of the order information is written into a "utilization" file generated by the camera that identifies the order and includes pointers to the image files that store the images required to "fulfill" the order. The "utilization" file is stored in the internal memory 32 or the memory card 36. For printing, order composition involves selecting the quantity, print size, and quality level (e.g., thermal or ink jet) of the images to be printed. For example, the user might choose one "standard" (4" x 6" size) image of 2 different images, and 2 standard size images plus one "enlargement" (8" x 10" size) image of their "favorite" vacation image. The print order information is provided in the utilization file that identifies the order and includes pointers to the image files that store the images required to "fulfill" the print order. In addition to "normal" type prints, the prints can be "creative" prints, using one of the creative backgrounds selected on the host computer and downloaded to the camera along with text. In this case, the "favorite" image might be surrounded with one of the border and captions provided via the host PC 10, as shown in Figure 3. The user can then take or mail the image memory card 36 containing the image files and order information (utilization file) to the print service provider 14. The provider reads the information, fills the print order, and returns the print order either for pick-up by the user or by mail. The service provider 14 charges the user's credit card account (which can be stored in the print order information file) for the prints provided. Alternately, the user can place the card 36 in a slot 50 of a "walk-up kiosk" 16 along with a credit card. The kiosk can then automatically produce the prints required while minimizing the amount of user interaction required. Finally, the user could place the card in a home printer 48, and the printer could automatically produce the quantity of prints of each image required. In the last two cases, the size and quality of print types available might be limited to those available by the kiosk 16 or the home printer 48. Alternately, the camera could incorporate or be connected to a wired or wireless modem, such as the communications interface 28. In this case, the print order information, and the image information needed to fulfill the print order, would be transmitted to the service provider 14 along with the account information through the communication network 31 (which could be a wired or wireless network). The service provider 14 would print the order and mail the prints back to the user. Instead of, or in addition to, composing a print order, the user may choose to transmit one or more images to others. These images can include the "creative" images and/or text described above. The user selects the images and the person(s) who will receive them, from the group of addresses loaded into the camera via the process described earlier (the software application running on the home PC 10). The e-mail order information is provided in the utilization file that gives the e-mail address and includes pointers to the image files that store the images required to "fulfill" the e-mail order. If the camera includes a transmitter, e.g., a cellular connection in the communications interface 28, the camera could include and initiate a "send" command that the user would enable after completing the e-mail order. This command would automatically send the appropriate images to the appropriate user's e-mail accounts through the network 31 using the appropriate communications protocol (FTP, mailto, etc.). Alternately, the camera can be placed in a docking unit (not shown) containing the modem. The images can then be automatically transmitted to the service provider 14, when the camera is inserted into the dock. Alternately, the memory card 36 could be removed from the camera and placed in a kiosk, which would then transmit the images and bill the user's charge card. Instead of, or in addition to, composing a print order and/or an e-mail order, the user may choose to transmit one or more images to their "electronic photo album" account, which could be maintained by the service provider 14(or alternately could be maintained on the user's home computer 10) in an image "album" storage 52. In this case, the user selects the images to be transferred to their photo album, and optionally selects what group of users might be allowed to view the images. The groups may include "Self only", "Self plus immediate family only", and "All" (family, friends, etc.) The information may include text, which may be input and selected as described in U.S. Patent No. 5,633,678, "An Electronic Still Camera for Capturing and Categorizing Images", filed December 20, 1995, and assigned to the assignee of the present application, and which is incorporated herein by reference. Instead of having the camera 12 communicate directly to the "downstream" service provider 14 over the communications network 31, the communications network 31 from the camera 12 could alternately be connected to an internet service provider (ISP) (not shown) such as AOL (America On Line), Earthlink, Eznet, etc. The "downstream" service provider 14 would then be connected to all ISPs via the internet, eliminating the need to maintain a separate communications network. The ISP would transfer the utilization file data and images needed to order prints and album images to the downstream service provider. The ISP could itself handle e-mailing of images to other users, using the data and images in the utilization file. The utilization order information is provided in the utilization file. The general file organization is shown in Figure 4, and a detailed example of the file contents of an elaborate utilization file is given in Appendix I. This file may be encrypted to prevent unauthorized use of the sensitive information, such as the user's credit card number. Referring to Appendix I, a Global information section (lines 2-26) provides the customer information (name, address, credit card), as well as the time the order was placed, and whether it has been processed or not. The file may contain one or more Print Order sections. For example, lines 28-37 describe a print order of "standard" size (4" x 6") prints of the images made on a silver halide based CRT printer. Line 34 indicates that two copies of the image referenced in line 33 will be printed, while only one copy of the images referenced in lines 35-36 is printed. A second print order section (lines 39-55) indicates a large size print (24" x 36") should be made on a silver halide printer and mounted in particular in a walnut frame. This printer should be sent via UPS to the address shown in lines 47-52. The image is the composite shown in Figure 3, which is described in the CreativeDetail section (lines 76-90). An e-mail order section (lines 57-65) provides the e-mail address and a list of images that should be sent to this address. An album order section (lines 67-72) provides a means for adding images to the users on-line photo album. The user can classify the images under a particular heading (e.g., "vacation" images) and indicate who is allowed to access the images via the internet. A Creative Detail section (lines 74-90) defines each creative image, such as the image in Figure 3. It also describes user defined text (line 81). Multiple templates and user text options may be downloaded from the host computer to a memory card that is then inserted into the camera, prior to taking pictures. The template (background) may be an identification code that is only added, for example, during printing. In this case, the template is not viewed when the image is displayed on the camera. Alternately, a low resolution version of the templates desired by the user can be stored in the camera, so that the user can preview the final composite image. A high resolution version of the template can be used by the service provider to print the final composite image. The user may decide to crop and rotate the image (lines 86-87) prior to inserting it into the creative background. Finally, an image detail section (92-102) describes the file type (e.g., FlashPix, JPEG, TIFF) and location of each image. In this example, the three images are all FlashPix images located on the memory card "Local Card" in the "vacation" folder. Most of the information in GlobalInfo and CreativeDetail sections of the digital camera utilization file, for example the addresses and creative text, is downloaded from the host computer to the camera prior to picture taking. After reviewing the images, the user uses the image LCD and user interface to select which images to print, e-mail, and album. The print size, e-mail, albuming, and creative options are offered by pull-down menus that match the options provided by the service providers they have selected on the computer and downloaded to the camera (via the card). The full utilization file (Print order, e-mail order, etc.) is then created by the camera based on the user selections. A much simpler print utilization file is shown in Appendix II. In this case, the camera simply allows a print order to be created. The memory card 36 containing the images and the simple utilization file is then inserted into the home PC 10, the home printer, or the walk-up kiosk 16 or sent to a service provider via a communications interface. The proper number of each selected image is then automatically printed, without further user intervention. Instead of providing the utilization information for multiple images in a single utilization file, other embodiments are possible. For example, the camera may create three utilization files, one containing the information needed to produce a print order, a second containing information needed to provide electronic albuming, and a third containing e-mail order information. Alternately, the utilization information may be provided with each image file, as shown in Figure 5. In this embodiment, the print order information describing the number and size of each image to be printed is included in tags provided within each image file. For example, image file #1 contains the image data and a tag indicating that the user has requested one standard size print. Image file #2 does not contain a print tag (or alternately could include a tag with the number of prints set equal to zero) so no prints will be made of image #2. Image file #3 includes a first print tag indicating that the user has requested two standard size prints, and a second tag indicating that the user has also requested a single 8" x 10" size enlargement. Other aspects of the invention include a digital printing system wherein the image utilization file includes the number of copies of at least one print, a digital printing system wherein the image utilization file includes the size of at least one print, a camera as wherein the image utilization data for the plurality of captured images is contained in a single utilization file, and a camera wherein the image utilization data for each of the plurality of captured images is contained within an image file. means for storing the image utilization file along with the images in said memory and conveying this information to a utilization service provider. The camera as claimed in claim 1 wherein utilization includes providing prints of the selected images in various sizes, quantities, and/or quality levels. The camera as claimed in claim 1 wherein utilization includes providing the selected images to selected e-mail accounts. 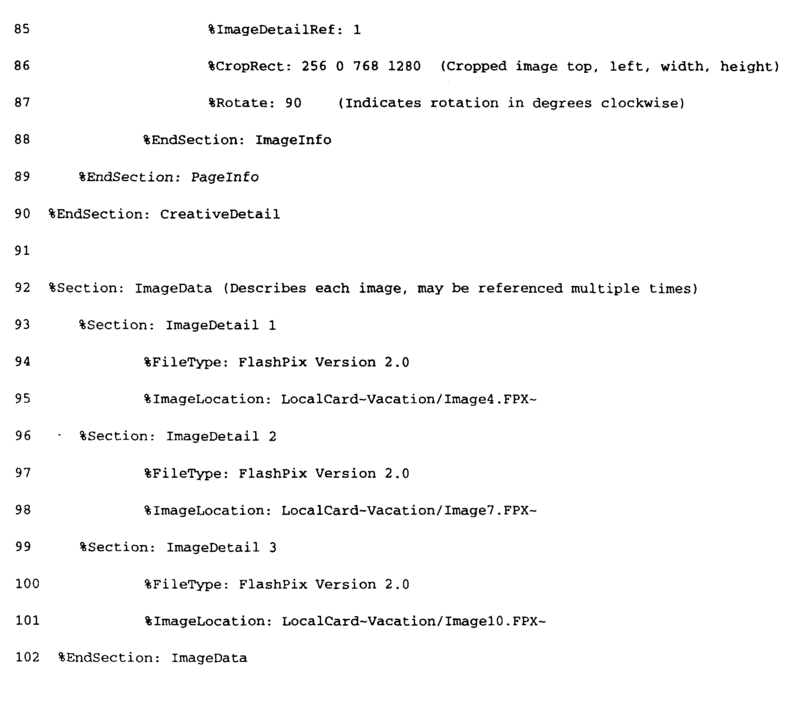 The camera as claimed in claim 1 wherein utilization includes providing the selected images to an image database server. The camera as claimed in claim 1 wherein the utilization information includes a user account number, charge card number, and/or mailing address. The camera as claimed in claim 1 wherein the utilization information for at least one image includes a text string and/or a creative background. The camera as claimed in claim 1 wherein the images and image utilization file are stored in the same removable memory. means for automatically controlling the hardcopy print means to produce the image order according to the information contained in said image utilization file. The digital printing system as claimed in claim 8 wherein the image utilization file includes at least one of a user account number, charge card number and mailing address. means for storing the image utilization data and the plurality of captured images in said memory.